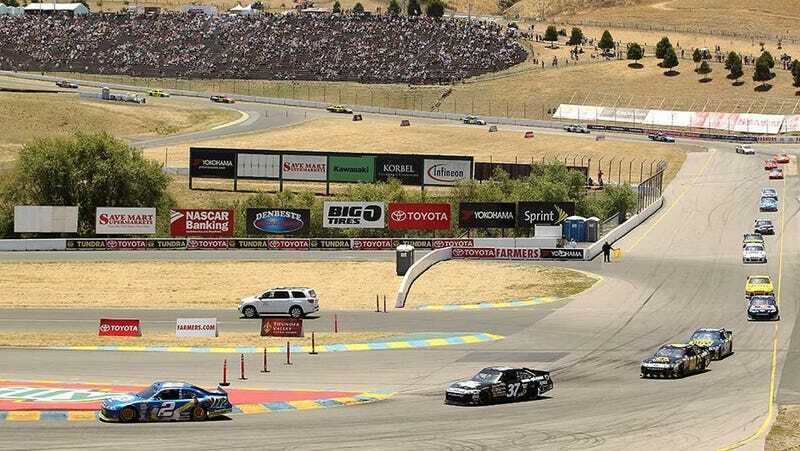 NASCAR has turned right for decades, but teams without full-time drivers and teams needing cash still look for outside drivers to compete at the few road courses visited by NASCAR. This weekend, the first weekend this year that NASCAR turns right, is no different. At Road America, notable entries include V8 Supercars driver Owen Kelly, who last raced Nationwide in 2010, and A.J. "The Dinger" Allmendinger, who crashed out on the first few turns of both races in Indycar's Duel in Detroit. At Sonoma, former F1 driver Jacques Villeneuve will drive for Phoenix racing, a year after Kurt Busch almost won for the same team. Villeneuve is a familiar face at Nationwide road races, but he hasn't raced a Sprint Cup car since 2010, and, surprising to me, his three Sprint Cup starts occurred at Talladega, Phoenix, and Indianapolis. Villeneuve has never turned right in a Cup car, so he should be entertaining to watch. Also entered is Paulie Harraka, an American of Syrian descent and part of NASCAR's Drive for Diversity program. Since 2010 he has raced in 11 truck races and 3 Nationwide races, and this will be his Sprint Cup debut. I'm sure there are others, but their names don't jump out at me.